Build Bridges to Life-long Learners — DestinationLearn, Inc. I was fortunate enough to grow up in a home that was full of books. Some of my fondest memories from childhood involve sitting around the dinner table with my parents and their friends following the conversation from one topic to another, until I would be sent to the bookshelf to pull a volume of the Encyclopedia Britannica set, so the adults could look up a subject or historical event they were enthusiastically discussing. My mother would then instruct me on the guide words to look for, help me zero in on the topic, and ask me to read aloud what I had found. I learned all sorts of interesting things this way, but more importantly, I learned to use reference resources to get a handle on the facts surrounding a topic. As I grew older, I returned to the brown-covered, gold-stamped volumes time and again. Sometimes, it was to help me get started on a report for school, and other times, I looked things up just to satisfy my curiosity. This is one of the more memorable way my parents modeled life-long learning for me. Having my own children now, I have come to recognize that life offers us so many daily opportunities to influence our children’s approach to knowledge. Not every interaction needs to create a lasting memory in order to make a lasting difference. This blog is dedicated to helping parents and educators find ways to take small, effective steps toward showing children what they need to be successful in both school and life. Visit my latest blog entry or rummage through past posts for a topic that inspires you! Learning should always be encouraged. . .
and, if at all possible, made enjoyable! In our last blog we introduced a resource aimed at teaching our children to read and write through various ways. These tips can sometimes be unconventional and may seem like they don’t have any correlation to learning to read and write. However, the brain is a miraculous organ that learns in many different and unique ways! Without further ado, here are six more tips from 101 Ways to Help Your Child Learn to Read & Write by Mary and Richard Behm! If you have been following our blog for a while, you may have noticed that we are very interested in School Success and what we, as parents, can do to assist our children in this endeavor. There are numerous tips, tricks and ways to accomplish school success, but here are a few we may not have talked about before! We should encourage our children to bring home their books from school, especially the ones they are required to read in class. This will not only jump-start a conversation about what they are learning or reading in school, but it also demonstrates our interest in what our children are reading. By having them read a section to us, or discuss what they like and dislike, we are encouraging them to think critically about what they are reading. The ability to discuss their own opinions on what they are reading also gives them a better insight and understanding of the materials they are interacting with on a regular. When we have something important to do, we often procrastinate or avoid it until it is absolutely necessary to get it done. Children are no exception to this, which is why it is important to make the time for our children to sit quietly and work on what homework they may have, or to simply sit and read quietly. Making this time a pleasurable experience is critical! Learning should always be encouraged and, if at all possible, made enjoyable! Parents can invest this time with their children as a way of learning and struggling together to get the work done. This demonstrates to our children that we are in this together and that they can trust us to be present and helpful. During the day, while we are at work, or while the children are at school, it may be that we see or hear something that makes us think about them. When this happens, we should write down what we were thinking and encourage our children to do the same, then compare those notes when we are together again. For example, “Today, I saw a red bird outside the office window. It made me think of you and what you might be seeing outside the school windows.” We can use notes to start conversations and let our children know that we are thinking about them throughout the day. Bedtime (along with doctor visits and sometimes, bath time) is an oft-resisted ritual. Children worry they might miss out on something. How can they sleep when there is so much going on? For this reason, it is important to establish rituals to prepare our children for sleep. Rituals create expectations, structure and a feeling of security for our children, so that even if their day is not going well, they have something they can look forward to or hang on to. The idea of bedtime stories is not new. Many people already read stories to their children before bed. However, wouldn’t it be interesting to flip the script? Instead of reading the bedtime story, we are read to! Reading aloud is important to pronunciation and vocabulary retention. Encouraging our children to read to us at bedtime helps them better understand their language and allows them some control over bedtime. As we grow up, our memories sometimes fade and we forget simple moments with our parents. In the same way that our school skills become duller over summer break, our memories become less clear when we are not actively talking about them. An easy way to sharpen our memories is to keep a diary or journal. As we grow older, journaling can fall by the wayside, but if it is established in early years the habit is hard to break. At bedtime, we can set aside some time to write down the events of the day with our children. By doing so we can create a written record of happy times, or even sad moments that we learned from, and we are creating a conversation between ourselves and our children. This gives them a moment to talk about the things that happened in their day, what in their day mattered to them, and what they are really looking forward to for the next day. Dreams are a window into our consciousness. While Freud’s dream interpretation has been mostly debunked, there is something to be said about what our dreams say about our waking life. Over breakfast in the morning, we can start a conversation with our children about their dreams. Were they good dreams? What do we think they mean? We can share our dreams as well, especially if they are silly. Discussing the meaning behind what our brain is telling us through dreams gives us an opportunity to be introspective and to think critically. Dream journaling is another excellent habit to develop in early childhood because it gives us an opportunity to develop a trust and understanding of who we are and what things negatively and positively affect our dreams. Interested in more ways to help your child with reading and writing? Check out this week’s resource through the Amazon link below! For our next post we will be returning to the topic of technology and our children. We hope to shed some light on potential hazards when texting, what smartphone apps to be wary of, and how we can continue to keep our children safe in a technological world! As always, we look forward to reading your comments and suggestions! provides suggestions and information for parents on how to best help their children become more literate and get a good start on the road to school success! Over the course of this blog, we have talked about numerous ways to encourage literacy in our children and what we, as parents, can do to support their learning. This two-part blog is no exception and we are pleased to talk about an excellent resource for helping our children learn to read and write! 101 Ways to Help Your Child Learn to Read & Write by Mary and Richard Behm, provides suggestions and information for parents on how best to help their children become more literate and get a good start on the road to school success! These suggestions, spread out over nine sections, range in topics from what you can do while out and about, how to handle when you are not around, and even how to use the television to help! Today we are going to cover six suggestions from two different sections of the book. These suggestions can provide crucial information we can use to approach different scenarios we may find ourselves in with our children’s education. When we are new parents, one of the first things we do with our newborn babies is to coo at them and often, we coo in response to them cooing. Cooing is a natural response when interacting with a baby or small child, as they do not have the language skills—yet—to speak with us. The thing you might not know about cooing, however, is that it can encourage literacy! By cooing in response to our babies’ cooing, we are helping them to develop their language skills and encouraging them to vocalize more! Babies love peek-a-boo. It is a very common game that we play with babies and small children, even babies and children we don’t have an acquaintance with. Peek-a-boo is a great imitation game for babies and toddlers, because they have a chance to act the way they see us acting. Imitation, while also the sincerest form of flattery, is another excellent way to encourage literacy and writing! They are learning what they see us doing, and even a simple game of peek-a-boo is encouraging imitation and brain development! Bright colors, simple pictures, and movement are all ways to stimulate and engage our babies’ brains! Having a colorful mobile above the crib or looking at board books engage the brain in unique ways, stimulating the continued creation of neurons! Looking at board books also begins the process of print awareness, which is when our children begin developing a sense of the world of letters and books! As parents, we spend a lot of time with our children cooped up in the car. Whether it is back and forth to the grocery store, heading to after school activities, or even going on family vacations, it is important to continue encouraging our children to be better readers. Playing learning games in the car is a great way to connect with our children and help them with their reading. Games that involve matching, or memory are easy and fun ways for children to practice their literacy skills. Create your own flashcards by using index cards, pictures and writing what the picture is. Children can match the words to the pictures and vice versa. This is especially good for shorter trips. For games involving memory, try out a listing alphabet game. To do this, we start with “I am going to the store and at the store I will buy apples” and then the next person repeats what was said and adds to it. An example would be “I am going to the store and at the store I will buy apples and butter.” Keep going back and forth until the end of the alphabet is reached, or we forget what was said. In a previous blog we talked about a game called “A was an Apple Pie” and this is just one example of Alliteration, which is a fun way to learn more about words and the alphabet. Each new phase of the game has a new letter and new action happening to the imaginary apple pie. An example would be “A was an Apple Pie, A ate it,” or “B baked it.” This demonstrates alliteration and helps our children get creative with their word choices. We are increasing vocabulary with each game and learning about alliteration at the same time! For our next post we will be covering six more suggestions from the book 101 Ways to Help Your Child Learn to Read & Write by Mary and Richard Behm! We hope that you are enjoying this invaluable resource and we look forward to hearing from you! Leave us a comment with suggestions for content you would like to see, how you center learning for your children or just to let us know how we are doing! of how our relationships with our children work, not only with ourselves, but with their teachers. In past blogs we have shared a book by Dr. Stephen G. Peters titled Do You Know Enough About Me to Teach Me? This book focuses on the importance of working relationships between teachers and their students, with an emphasis on developing these relationships through communication and understanding. Today we would like to bring that topic back to the forefront by introducing Dr. Peters’ other book based on the same principles. 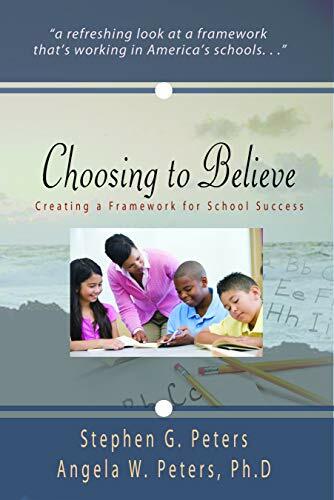 This work is titled Choosing to Believe: Creating a Framework for School Success. This book, though primarily addressed to teachers, is also relevant to our relationships with our children. Over this blog, we have stressed the importance of a relationship with our children as we are their first, and most important, teachers. Our influence on our children’s lives, for better or worse, is enormous! Communication is key to establishing the relationships we build with our children and the impact this can have on their lives. For these reasons, it is important that we have a well-rounded understanding of how our relationships with our children work, not only with ourselves, but with their teachers. In chapter four of Choosing to Believe, Dr. Peters states that “many students voiced their concerns about their inability to trust adults,” in the interviews for his previous book. This inability to trust the adults around them, leads to a diminished classroom experience, as well as creating the feeling of isolation. With these feelings comes detachment from the adults around them, furthering any decline in academics that may have already been present. Listen, not solely to respond, but to affirm and become sensitive to their viewpoints. Be responsive, especially to conflicts or issues they may bring up. Do not impose power or authority to control behavior. Be quick to repair relationship conflicts, instead of allowing them to fester. These steps can be just as important to parents! When we simply impose our power as adults over our children, we create a disconnect, by immediately shutting them down. If we take the time to listen and be responsive, we can prevent that disconnect in the first place. Listening to respond means that we miss the meaning behind the words, and we may miss crucial information because we are too focused on what we want to say. While being a model of kindness should go without saying, think of how many times we may lose our temper and model rude behaviors in public. Whether it is in traffic, at the grocery store, or in other public situations, we must always be aware of what we are showing our children through our own behavior. In chapter six, Dr. Peters talks about the three stages of success. These stages can be characterized as cultures of order, audacity and commitment. While all these stages are important, the last stage—commitment—resonates the most with parents. We can talk about the importance of our relationships with our children, their teachers and what it takes to create school success, but if we don’t make the commitment, all of the other stages are irrelevant. We cannot expect to accomplish anything if we do not first commit to our actions and the course we have chosen to take. If you are interested in learning more about this book or in purchasing a copy for yourself, please check it out through the Amazon link below! We will be talking about a book called 101 Ways to Help Your Child Learn to Read & Write! This resource by Mary and Richard Behm, goes over all the interesting and unique ways we can encourage our children along the path to literacy! I look forward to reading your comments and suggestions!